This was an event the Royal Plymouth Corinthian Yacht Club (RPCYC) was actively involved in. The RPCYC Commodore Paul Willerton and his committee decided to commemorate the life of the club as it then was for future generations and invited Gordon Frickers to submit some ideas for paintings. Given complete freedom, I chose 2 themes to submit to the club committee. Here we see H.R.H. Queen Elizabeth II arriving in Plymouth on the exact evening 400 years after the battle fleet of her illustrious predecessor Queen Elizabeth I had sailed to combat with the Spanish Armada. 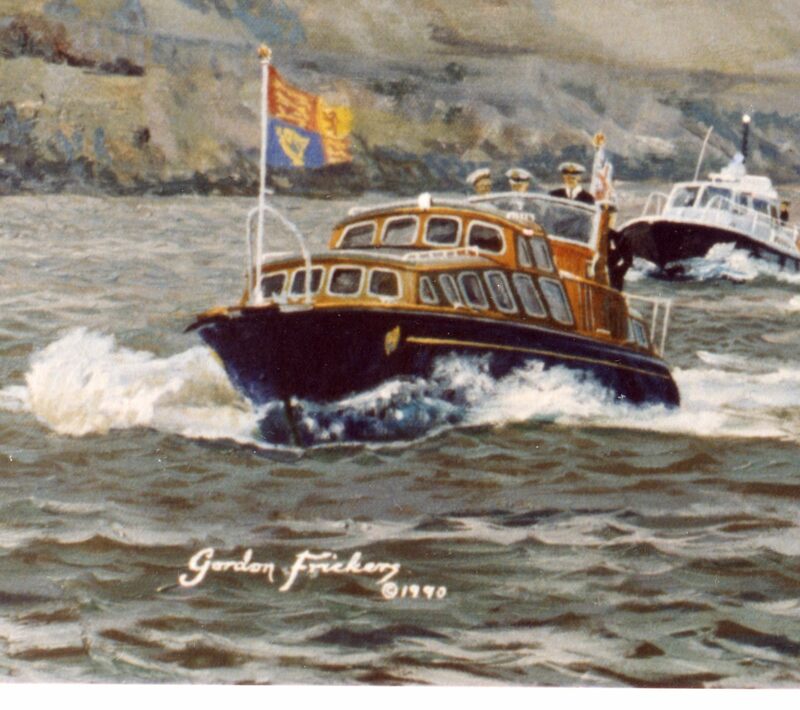 To create this painting I was present as the Royal Yacht Britannia arrived in Plymouth and as H.R.H. Queen Elizabeth II disembarked for an invitation to the naval dockyard for dinner. The then Plymouth harbour master, Tony Dyer personally drove the launch I worked from on that damp and misty summer evening. The painting shows to the left, Plymouth Citadel, the RPCYC club house and in the background also the River Plym, Sutton Harbour Entrance and the low hills towards Plymstock. At the time (1988) this seemed a very “contemporary” painting. 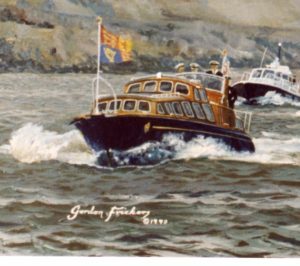 Since then the Clubhouse has been extended, the RY Britannia withdrawn from service and both Paul Willerton and Tony Dyer long since retired. It is perhaps surprising how quickly the committee’s vision is being realised, the subject is becoming history. ‘Armada 400’ commemorated the defeat of the ‘Spanish Armada’, a very serious attempt to invade England, displace the queen and her government, and reinforce by armed force, the Roman Catholic religion, upon Protestant England by the gallant sailors of Queen Elizabeth the first lead by men of Devon, the now known collectively as the legendary ‘Sea Dogs‘. They included Hawkins, Drake, Raleigh, Frobisher and many more. Queen Elizabeth the first’s fleet was based in Plymouth anchored on the Cattewater, lead by Plymouth men who made up a high proportion of the crew members. For some years I lived near by, taught my children to sail on that historic water, and kept a yacht moored on the very same piece of water. The Royal Plymouth Corinthian Yacht Club was much involved in the anniversary, ‘Drake 400’, of the defeat of the Spanish Armada including hosting most convivially an other special guest, the Spanish Ambassador.